Palawan has been a familiar name to me ever since I was in high school. A cousin of mine married someone from the place so they settled in this place known as the cleanest city in the Philippines, Puerto Princesa Palawan. See the #ByaheNgKokobears Palawan Adventure overview here. I have been curious about the world renowned Underground River and just last year (2015) December I had my personal experience of this enchanting place! Let me start by saying at first I thought we were unlucky to be in Palawan during these final days of the year wherein the last sets of typhoons are also scheduled to hit the places we are ought to visit (Bohol & Palawan). We stayed at Astoria Palawan for 4 days & 3 nights. We had our itinerary full packed but have to be adjusted depending on the weather condition. 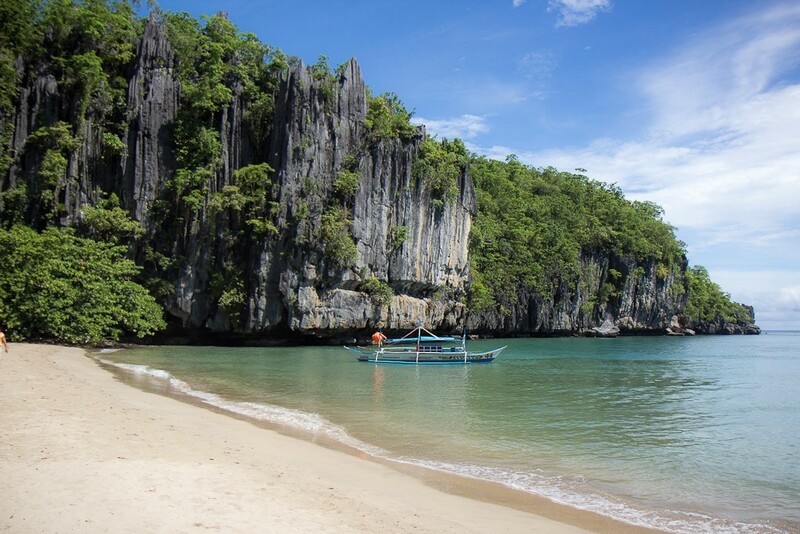 Also know as Puerto Princesa Subterranean River National Park, is first on our list and was supposed to be a day 1 experience but has to postpone it on the day 2 because of heavy rains and that no one is allowed by the coastguard to travel that way of the sea. But to our surprise, our tour provider advised us that there is an alternative way to get there! Our tour guide & driver accompanied us to the registration area where they have assigned a local kid () to be the internal tour guide as we hike up to the mountain and go to the other side of the underground. He was only 15 years old – a bit shy at first but as we sweat off and go further for the next 30 minutes of walking through the wet forest he started to be talkative. The forest was all green, several of plants surround it and different sizes of trees filled it. Excuse the blurry pic! Our tour guide moved right after clicking the button of our GoPro 😀 Imagine how big this tree is!!! The soil was a bit brownish/orange-gy and wet, a rain was about to come. We have to hold some plants us we ascend to the next level. There were 4 stops. Where we could take a rest, drink water or take some photos. And in each stops there are rescue team as well whenever there is a need. We have to go up and down with various man-made stairs (made of wood) which will definitely test your breath!!! Way to go!!! Climb pa more! This one is on the way back to our hotel… where we stop by in some of the mountains that shaped like an Elephant and a photo of this yellow tag wherein 2 Amazing Race were done! We met with other tourist who also took the challenge to walk for 1 and half – 2 hours just to see one of the world’s wonder! We hurry to fill the little boat, put on our head gear and sail. Of course some briefing was made. Inside is all black! It is the darkest at its finest. It is natural and should be maintained to keep the bats stay underground. Inside or underground are beautiful natural creations of stalactite and stalagmite! Formations of people, food, church and all! A plus factor is that our guide seems to know when and where to stop amidst the dark place and a sense of humor while introducing the spots. Above are some of the captured photos while we were inside… there actually videos but I chose not to put them in to keep you curious and find your way to this beautiful place! All the walk and pain and tiredness have gone once you get a glimpse of this amazing underground river. I realize it as we went home and see the mountains that under those mountains is the river enchanting as it is even while imagining it. There is a special beach or shall I say photos only beach – white sands shore that makes an impression of a faraway island, secluded yet majestic! 🙂 … Had our time to do the snaps and take a minute or two to feel the beauty amids the stormy & wavy sea during our time. We have our own photos but somehow misplaced it. Will update this once I see it!